Today Brenda Hauff and I will be presenting Creating an iTunes U Course as Easy as 1, 2, 3. I think we are ready to go. The presentation is done the sample courses are made, and the resources are all saved to either the sample course or Edmodo. We will be help other educators create a iTunes U course that they can use right away in their classroom. We will be showing them how to add materials, make posts, and share their newly created iTunes U course. I will also be showing how they can even create their own interactive ebook to go along with their iTunes U course. Thanks to Edmodo we have a home to save our resources to and create a learning environment with our attendees. Our attendees will be able to ask questions even long after we have left the session. Our resources will be at their finger tips and they will be able to go back and review or even retrieve them if needed. My bag is packed, the presentation is ready, and my nervous are bouncing all over the place. This is my 1st time attending FetC, and I can't wait to connect, learn and share with these amazing educators. FetC is a national conference which is a content-rich conference that brings education leaders and technology experts together. 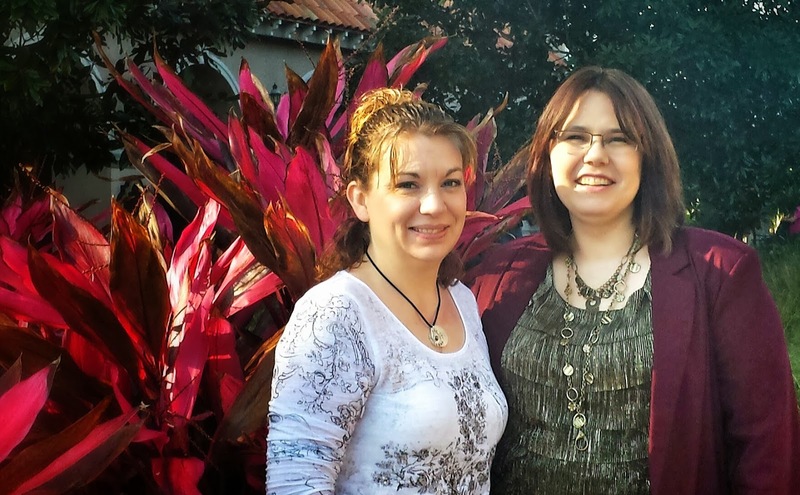 I am honored to be co-presenting with Brenda Hauff on Tuesday Jan. 28th. The workshop is about Creating an iTunes U Course. If you plan to attend make sure you have a iTunes account or Apple ID. 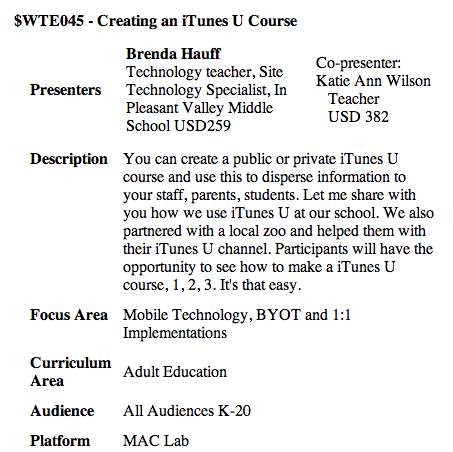 We will be teaching you how easy it is to create a iTunes U course you can use in your classroom. This past few months had worked towards becoming an Edmodo Certified Trainer. Now I get the privilege of hanging out with the staff and other Certified Trainers of Edmodo at the Edmodo booth. Feel free to stop by and chat. I would love to share with you my experiences with Edmodo. On Jan. 30th and 31st at 12:30, not sure of the location, I will also be presenting how I created My Global Project with the use of Edmodo. The presentation is short and sweet and you will get an over view how I created my Global Project within Edmodo. I really like that FetC has an app so that I can still remain paperless and still be able to stay connected and informed of what is going on at the conference. There are a lot of things to do while at the conference. I plan on visiting the poster sessions, and several booths as well as attending sessions of course. I can't wait to meet the SimpleK12 peeps, after attending 200 live webinars from SimpleK12 I kind of feel like I know them already. To kick off my experience I get to join in on a Photowalk. The photographer in me is doing the happy, happy, joy, joy dance. I will have a calling / business card and since I am really into Augmented Reality I added an augmented Reality component to it. If you visit me be sure to pick up my card and scan it with the Layar App. VoiceThread is a great presentation tool. You can use it in many ways. I choose to use VoiceThread for my 6th grade students and reporting on Ancient China. I had my students compose their reports on a Google Doc and cite their resources before I gave them an iPad to record their reports. You do not need an iPad to create a VoiceThread it can be done via their website. After I had given them feedback and approved their report then they were given an iPad to record their report, they also had to find 3 images that represented their report. I did have them make their recording all in one setting. We found it hard to edit VoiceThreads via the app. Below is an example of one of the Ancient China Reports. Free accounts are limited, you can only create so many VoiceThreads and you can't delete them. If recording with the app, do all of your recording at once. We found it hard to edit VoiceThreads via the app. You have to confirm your email so I created Fake/Disposable Emails for this. In the past students and teachers could only obtain access to technology was through a lab setting. Schools hired professionals to teach and or train students how to use the technology. Once students left the lab setting they left the technology behind. In todays world that is no longer the case. 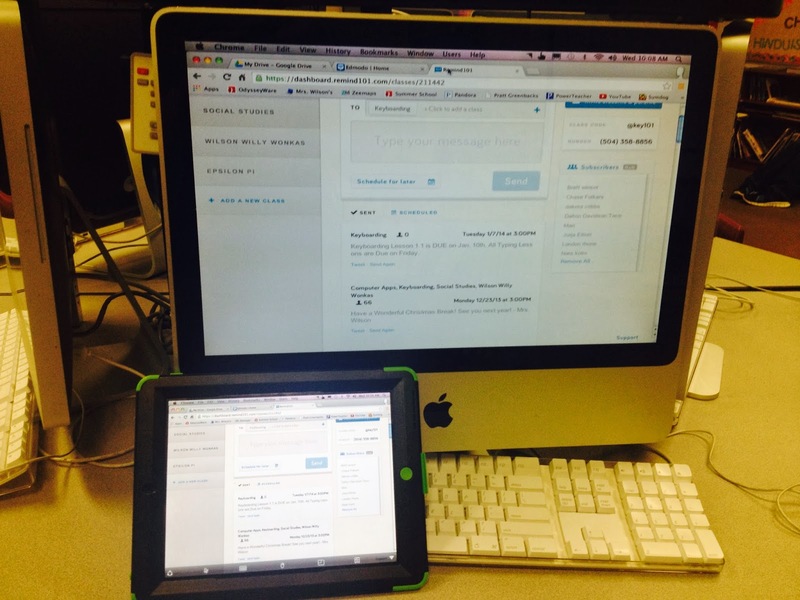 With schools going 1:1 with devices is the lab really needed? There are some pros and of course cons to having a lab and 1 person responsible for teaching how to use the tech. 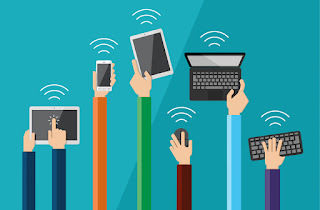 All devices are set up the same and have the same programs. 1 person is responsible for the instruction. Desktops don't walk away and are stationary. Only 1 person is responsible for the instruction. Technology and skills stay in the lab. Limited time and use in the lab. When it comes to technology and learning how to use it needs to be put in real world experiences not in a structured lab setting. One teacher shouldn't be the only one teaching kids how to apply the technology in real world settings. Technology is no longer just available in a lab, but can be found everywhere. The more diverse kids are with technology the better prepared for the real world they will become. Don't be afraid to let your students teach you how they use the tech. Don't be afraid to fail. Failing is the 1st step in learning something new. When we learn to walk we fell with each step until we mastered balancing and walking. That didn't stop us from wanting to learn to run. Augmented Reality is technology that superimposes a computer-generated image on a user's view of the real world. 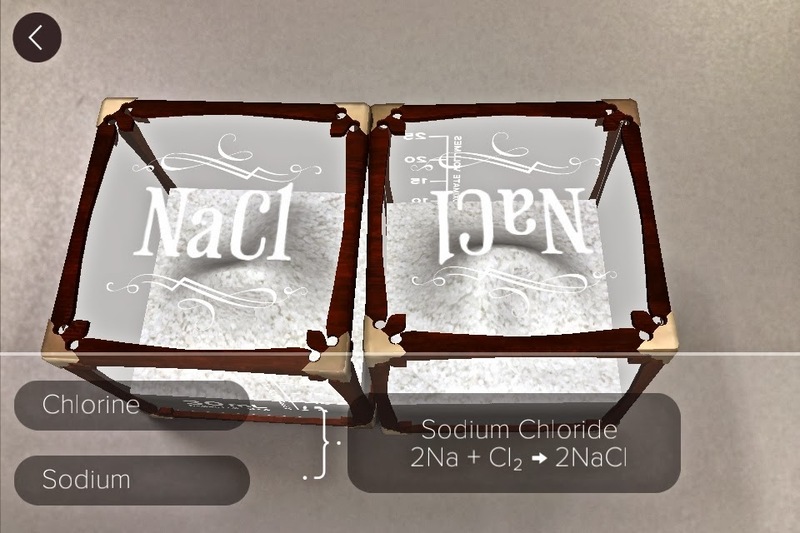 Daqri has developed cubes that have a augmented reality effect to them. 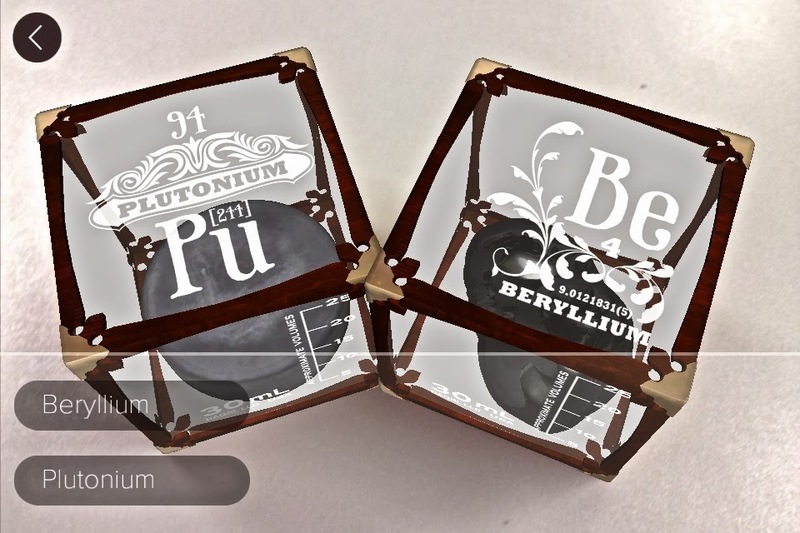 With the use of their app Elements 4D these cubes hold the element it is representing in a augmented reality state. You get to interact with 36 naturally occurring elements. You can see what they look like and their atomic weight. Some of the cubes even have reactions when put side by side. I will be sharing more about these amazing cubes. My plan is to have my students wear Google Glass while interacting with the cubes. I want to capture their perspective of this amazing technology that superimposes a different kind of reality in the palm of their hands as well as capturing their learning of the elements. 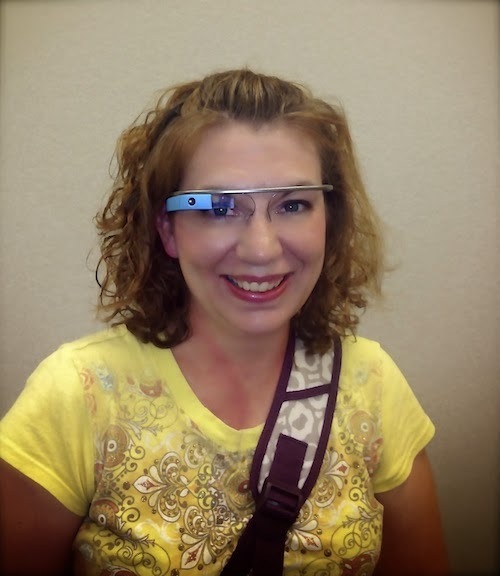 I was presented with an invitation to join the Google Glass Explorer Program. This invitation presents an exciting and unique opportunity to share learning experiences, stories, as well as a students' and teachers' point of view! I teach technology skills to middle school students as well as staff. Fulfilling this campaign will help bring Google Glass to our school that would other wise would not get the opportunity to learn and share this technology. The cost of Glass is $1500 and is a little out of my reach. Any and all donations will go towards purchasing Glass. In return for you support, you will receive a Thank You Tweet or email and a written Thank You letter from one of my students plus a Thank You letter from me. 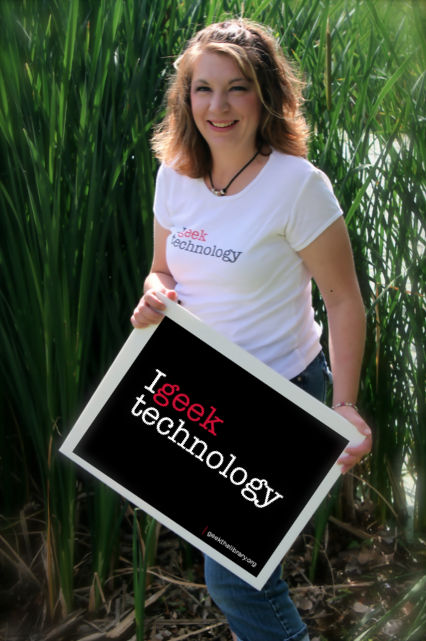 You will also be highlighted on my teacher blog - Diary of a Techie Chick as a supporter. You will then be added to the Making a Difference Section of my classroom eBook. 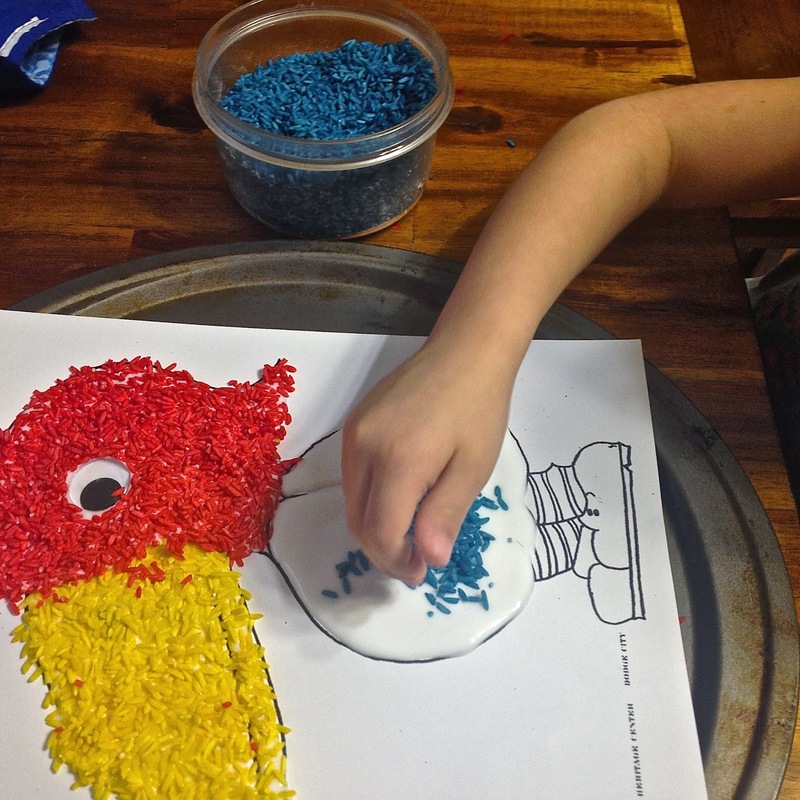 Please help sponsor me in creating meaningful learning memories with Glass with my students! I would use them to capture student's stories, their thought process, and problem solving strategies. Glass would also allow my students the opportunity to share their story, and learning experiences with the world. Bringing Glass into my classroom will do more than just put the technology in our hands, it gives my students an opportunity to explore technology that would otherwise be out of their reach. Remind them to use the Indiegogo share tools! Today was a great day to learn something new and boy did I ever. I participated in 7 webinars from SimpleK12 over a variety of Mobile Learning topics. 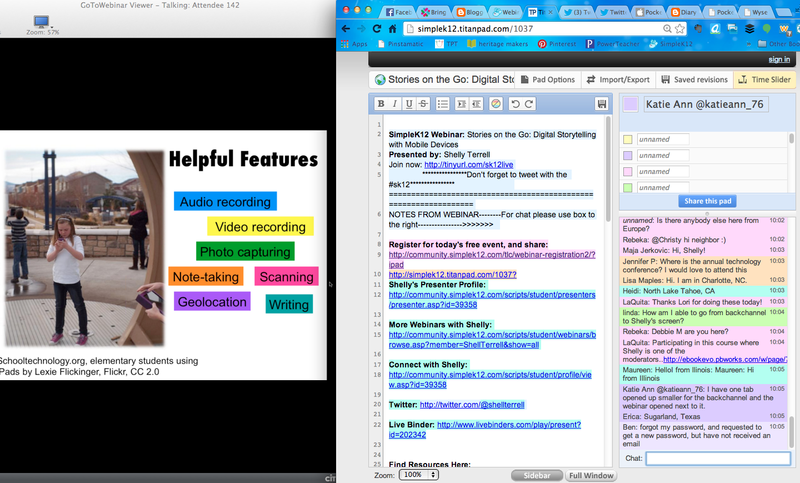 While participating in the webinars I also followed via Twitter #EdcampLiberty. Between both learning platforms I gain a lot of information about different topics in Educational Technology or Teched. I think it is important that we continue our education no matter what our profession is. I just happen to be in the field of education and love learning. I suggest that you find a learning platform that works for you. "It isn't about the app or tool it is about the outcome!" I have a MOBI which is a handheld device that lets me control my computer, SMARTBoard tools, and other applications remotely. When the software updated recently it had stopped working, due to the computer I was using having an outdated operating system. I spend most of my time walking around my classroom and loved that I could control my computer from across the room. Since my MOBI wasn't working I started researching apps for my teacher iPad that would do the same thing as what my MOBI did. I found a handful but they cost money. Being a teacher and lack of funds I needed an App that was low cost or no cost. I found the following app PocketCoud Remote Desktop. This app is free. You do have to visit their website and download the computer software to the computer you are wanting to control. Run the Computer software. The username for the computer part of the setup is the name of your computer. The password will be the password for your computer. To Auto Detect - Enter your Gmail and its password. This will auto detect your iPad with your computer. After you have downloaded the app to your iPad you will need set it up to see your computer. Enter the same Gmail you used when setting up your computer. Make sure you are running the computer software. If so then you will need to click Done. Now you should be able to control your computer. Once you have your iPad is connected to your computer play around controlling your computer via your iPad. There is a little lag between your iPad and computer so be a little patient. To use your IWB a.k.a. SMARTBoard tools remotely you need to have them installed on the computer you are controlling via your iPad. I created an interactive eBook via iBook Author for my 8th grade Computer Apps class. It has some video clips I made or found very helpful along with interactive review questions and helpful screenshots. I used the eBook this past semester with my students. The feedback from my students was very positive. They liked being able to watch, pause, rewind, and even fast forward the video clips I made. I also received high marks from my students because I had hyperlinked the videos to my classroom YouTube channel. Now that I had a chance to use it with students I went back through my eBook and made some minor adjustments suggested by my students and added student created examples. 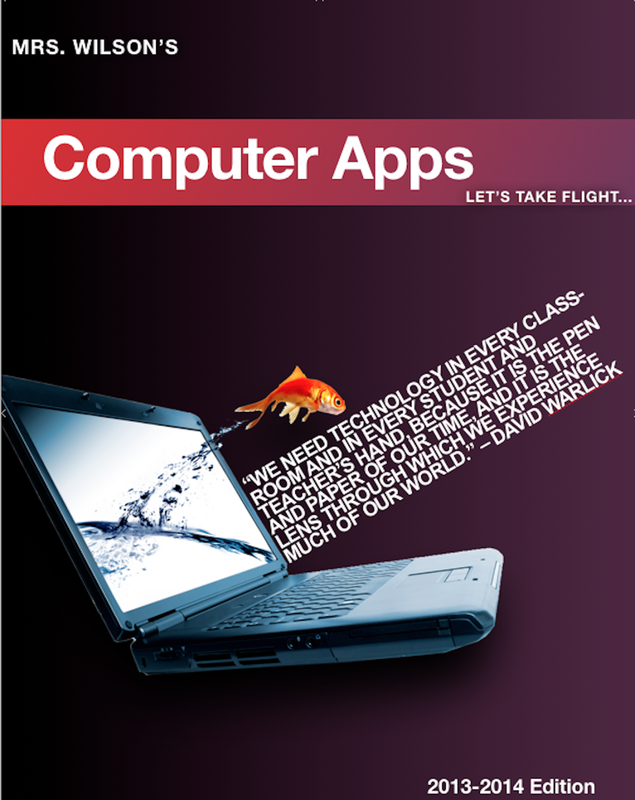 If you would like to view my little eBook Mrs. Wilson's Computer Apps - Let's Take Flight please click here. If you had previously downloaded my eBook via the iTunes store you should see in iBooks that is has an update. As I continue to use this book with my students I will be updating it as well as adding more resources. I am also known as the Queen of Typos. If you see a mistake please let me know. I accepted a Blogging Challenge by Manitoba Educators (#mbedchatblog) to blog at least once a month. My goal for 2014 is not to fade away but to share my experiences and reflections. With the help of the challenge and their reminders I should post as least once a month with either an app or tool I've learned about. 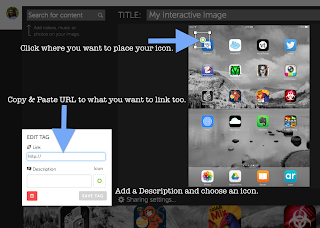 ThingLink is a tool to create interactive images. I learned about this tool last year but didn't really have a chance to really start using it. Since I will be presenting at different conferences this year I thought this would be a great tool to organize some of my content in a fun and interactive way. 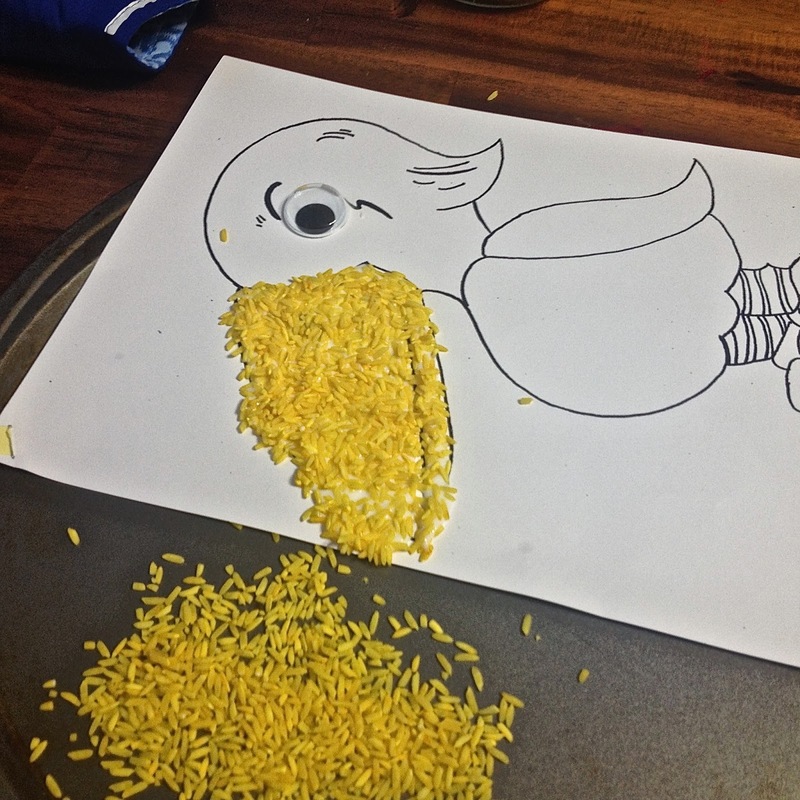 I also have plans to turn these interactive images to Augmented Reality objects too. 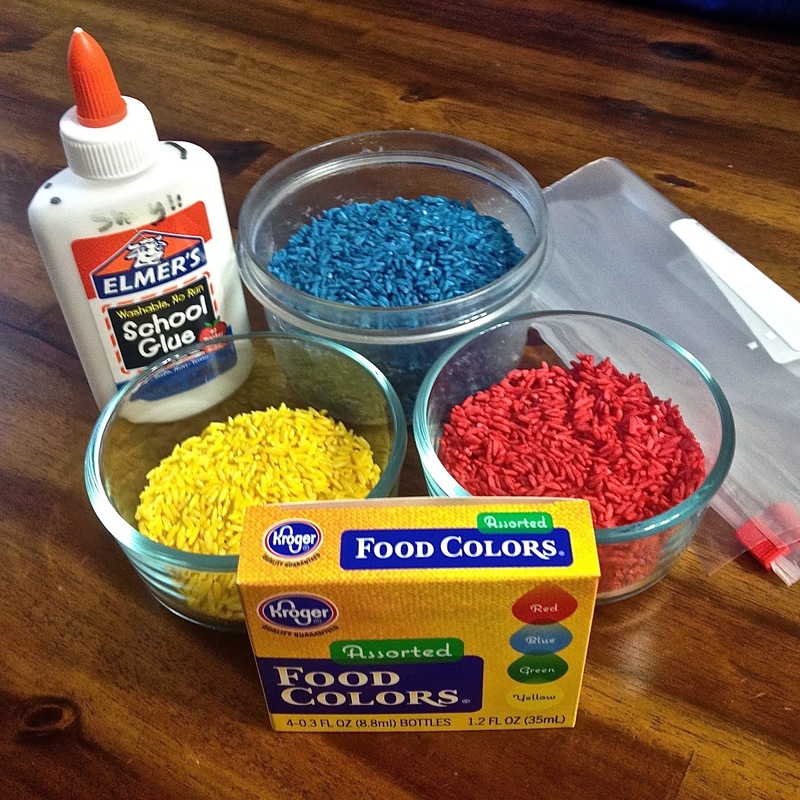 Below is an example of a ThingLink Image. 25 of My Favorite Apps on My Personal iPad. To make this interactive image I placed the apps I wanted to showcase all on one screen of my iPad. I then took a screenshot of my iPad. To take a screenshot hold down the Power Button and Home Button on your iPad. I like to call the Home Button the Belly Button of the iPad. 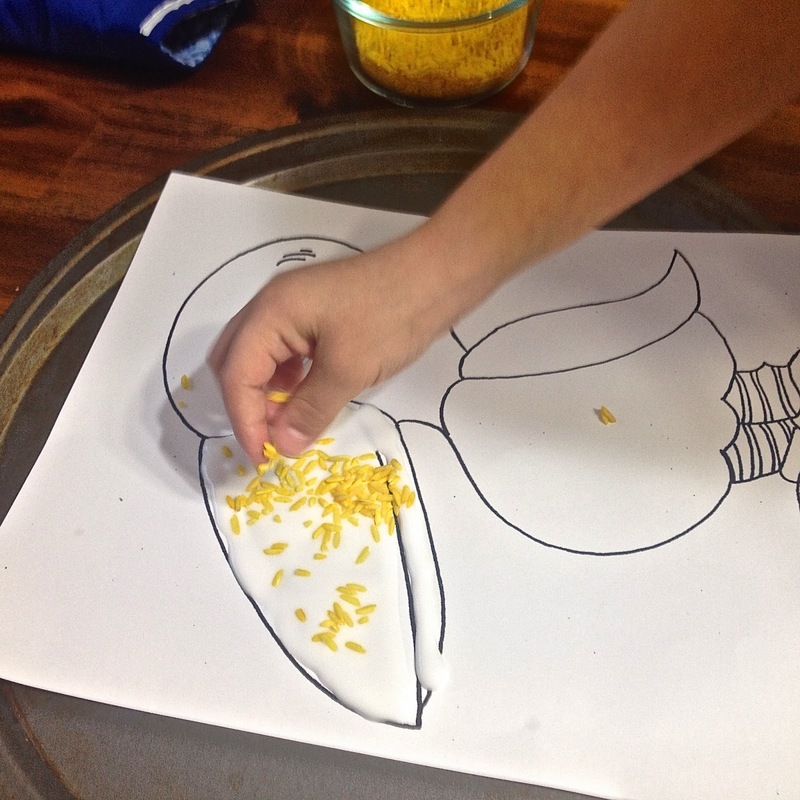 I then uploaded my image to my Thinglink account. I tagged each app icon to the URL of the app in iTunes, so that you can download it easier. The Layar app is also tagged to the Layar Creator website in case you want to create your own AR objects. Feel free to follow me on ThingLink. Technology is constantly changing and I try to learn as much as I can without overwhelming myself. I think it is important to be a life long learning and not get yourself stuck in a rut so to speak. The following list are tools I am going to try to learn more about and find ways to use them in my classroom. This is a small list of tools I would like to try. I think it is wise to keep your list short and simple once you learned what you set out to learn you can always add to your list. Tellagami - A mobile app that allows you to create animated video clips. LucidPress - Lets you create Publisher Items and Sync them to your Google Account. SubText - Allows Groups to exchange ideas in the pages of a Digital Text. 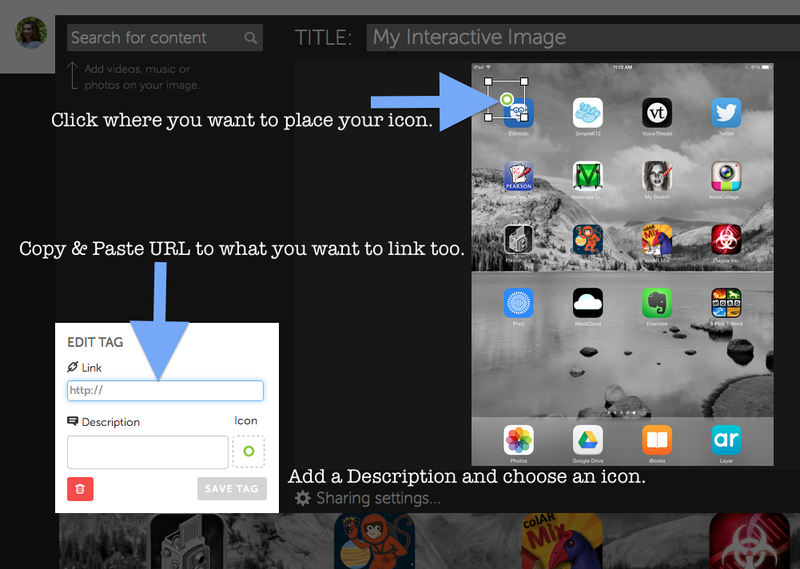 ThingLink - Makes your images Interactive. EdcampHome was the place to be this morning. The organizers of the EdcampHome really brought it today. It was well organized, Kelly did a great job with the Google Scripts and getting everyone where they needed to go. I myself stayed on the EdcampHome page and listened in on a few sessions. I really enjoyed all of the sharing and learning that went on today. I listened in on Augmented Reality and learning how others are using Augmented Reality in their classroom. I also peeked in on the Connected Classroom. Twitter is a great way to wet your feet in becoming a connected educator. I use Twitter to connect and build my PLN. If you would like to connect with me my Twitter handle is @katieann_76. 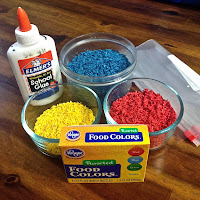 I also use Edmodo to build, connect, and to run my Global Project. I try to share my experiences by writing in my blog. Being apart of the Teacher Learning Community in SimpleK12 is another way I try to connect and share with other educators. Some teachers do find it hard to share what is going on in their classroom. My suggestion is to try one share tool being Twitter, a Blog, a Wiki and etc... Start slow and embrace your passion. In session 2 I learned about Virtual Field Trips. I didn't realize that Google had started Virtual Field Trips via Google+ Connected Classroom and Google Hangouts. To view upcoming Field Trips or past trips visit the Google+ Connected Classroom. I needed this little shot of inspiration today. I was able to listen in to all of the sharing while I worked on a presentation for FETC '14, Edmodo, LiveBinders, MACE '14, and ISTE '14. It really helped me to listen in on some of the questions to get an idea what others want to know or understand. Thanks for sharing and letting me be apart of #EdcampHome.